I have noticed random bits of hose without proper fittings before I think for example in India and just assumed they are for use by the cleaners or for filling the water jug in squat toilets. This makes me think there is a use for the hose for clients, not just cleaners. But for what purpose? Should I know how to use it as a tourist? Please tell me it's not a kind of alternative to a bidet! Possibly related is the fact that many toilet floors are awash with water. This can be a big problem if you're not wearing waterproof shoes or have to lower your trousers and keep them dry. Other than this toilets are pretty clean and I've seen both the hoses and the wetness in what I would regard as somewhat "fancy" places. These are used to wash the private areas after using the toilet, it is the upgrade to the jug, so instead of filling a jug and use it to wash you use the hose directly. To use it, hold it with one hand (the dominant) and press, water stream will wash away things, you also can use the other hand (non-dominant) to clean while aiming the stream to the private areas same way as you do when using the jug. So, the jug was upgraded to the hose, the hose was upgraded to the bidet (not in Asia), the bidet was upgraded to the toilet seats with built-in water washers (washlet). Anyway, most countries in Asia still use the hose which gives more control over the washing process. It is also used to wash feet and the toilet itself. You're convolving two independent Western traditions: toilet paper and sit-toilets. Even when using a sit-toilet, there are many ways to clean yourself. So you can clean yourself with water (rather than toilet paper) no matter what toilet you're using, and indeed that's what these hoses are for. It is hygienic: someone recently cleaned the bathroom, but didn't bother to completely dry it (I actually find the water rather comforting for that reason). In many cases, the room is an all-purpose wet-room: the shower is in the same room as the toilet, so the floor gets wet. It seems pretty efficient to me. Well just when I thought this had all been settled years ago, along comes a curveball! These are not very common in Taiwan. I have a feeling I might have seen one before this one but I'm not sure. 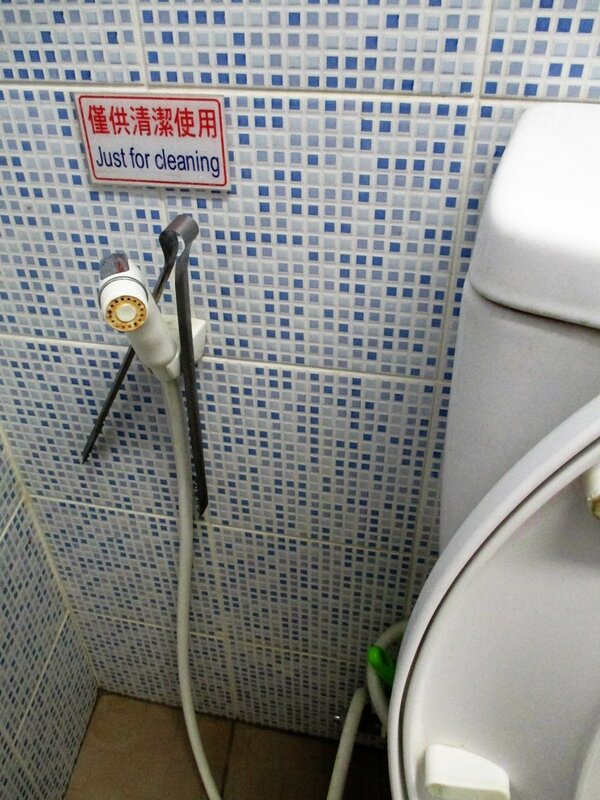 But this one in Kaohsiung is clearly labelled "just for cleaning"! Well I guess the English could be a little ambiguous but if they mean "just for cleaning yourself afterwards" why would they post a sign. Maybe somebody can see if the Chinese is clearer? 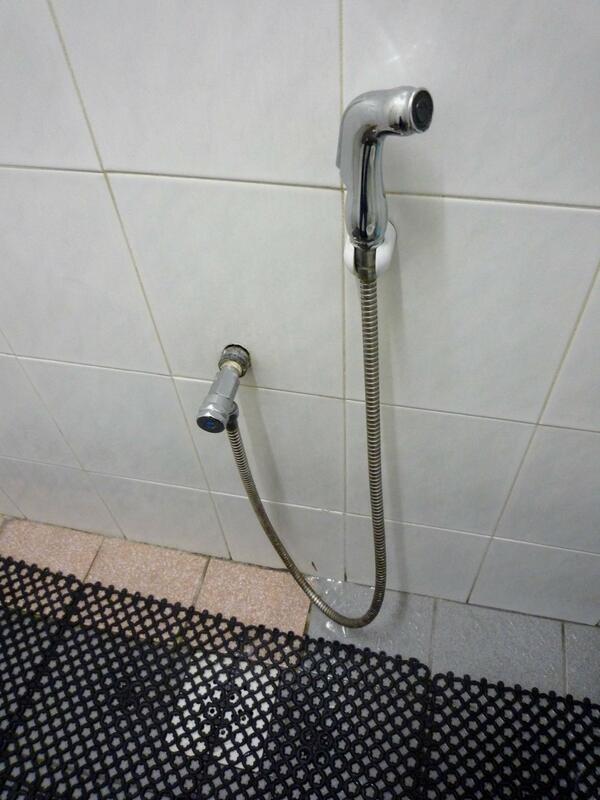 Anyway the moral of the story is if you're used to these being hand-bidets in other countries and your travels bring you to Taiwan, if you chance upon one it might not be best to use it in the manner to which you are accustomed. Not the answer you're looking for? Browse other questions tagged singapore hygiene malaysia taiwan asia or ask your own question. Which (South) East-Asian contries are the cleanest? Over the counter pain killers in SE Asia?